Would you like to create a breadcrumb trail for your Envira Album? This is easy to do using the Envira Breadcrumbs Addon. We’ll walk you through how to set up your album to use breadcrumbs. Can I change the look of the breadcrumbs? Why aren’t my breadcrumbs showing? In this instance, you’ll be activating the Envira Breadcrumbs Addon. Your first step will be to create or edit an Envira Album. If you need any assistance in creating an album, please review our documentation on How to create Albums using Envira Albums Addon. It’s now time to navigate to the Breadcrumbs tab. Here you can Enable Envira Breadcrumbs? for your albums and specify the Breadcrumb Separator you wish to use. You can also Enable Yoast Breadcrumbs? if you’re using the Yoast SEO plugin. 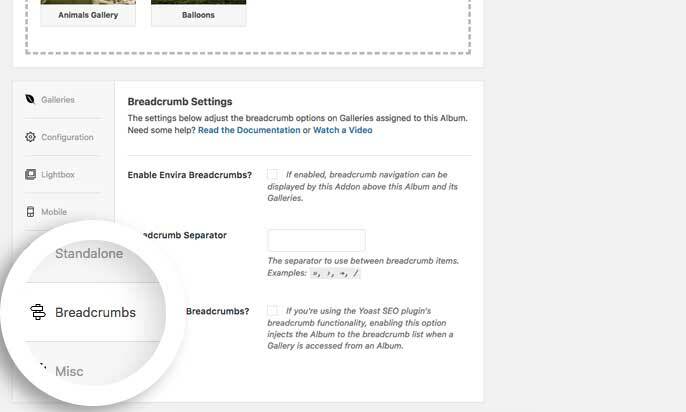 Once you’ve setup your breadcrumb settings, simply click Publish or Update on your album to save the changes. Finally, open your album’s standalone URL and you’ll see breadcrumbs appear above the gallery cover images. Then when a visitor clicks a gallery image to open the gallery’s standalone page, they’ll see breadcrumb links displayed above the gallery images too. Q: Can I change the look of the breadcrumbs? .envira-breadcrumbs a, .envira-breadcrumbs a:hover, .envira-breadcrumbs span.breadcrumb_last. Q: Why aren’t my breadcrumbs showing? A: Please check the link you’re viewing. The breadcrumb won’t show correctly if you’re not viewing the album from the standalone link. Added: envira_breadcrumbs_data and envira_breadcrumbs_html WordPress filters, allowing the "Home" URL to be filtered. Fix: Minor CSS update to keep tags and breadcrumbs on seperate lines. Fix: Minor spacing issue for last breadcrumb displayed.